Earlier tonight I brought my camera and its interface cable to school with me. Didn't take any photos, but was meeting with one of my fellow faculty, one who knows a whole lot more about cameras (film and digital) than I do. The plan was to see if she could figure out why my camera and computer haven't been communicating lately. Our meeting didn't solve any immediate problems, but we did eliminate a few of the variables. Tried some of her suggestions when I got home tonight. Maybe it was a coincidence, or maybe her advice, but suddenly things are working. So I downloaded all the photos that I've shot over the past few weeks and added them to the appropriate postings. Look back to everything between tonight and March 15th to see what you previously could only imagine. The second weekend of the NCAA Basketball tournament is over, and my brackets are pretty much a disaster. But I'm pleasantly surprised to have one of my print exhibition schools left alive- Villanova. 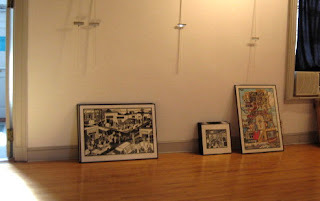 I had two prints on display there in 1997, part of a juried show called Art & Religion, organized by the Balch Institute for Ethnic Studies in Philadelphia. Artist response to the show was so huge (over 2000 entries) that they ended up splitting the show into 2 locations, with some of the work going to nearby Villanova University. The jurors ended up selecting 4 of my saints (the most works accepted of any artist in the show), splitting them between the locations. The two that went to Villanova were St Cecilia and St Augustine. As for the Wildcats, the tournament is notoriously difficult to predict, but the way they looked against Duke and Pittsburgh, they look to have as good a chance as any of the teams to win the whole thing. Back to the Studio for a while this afternoon. Used the big table to grade some messy student work (charcoal), then got to some of my own. 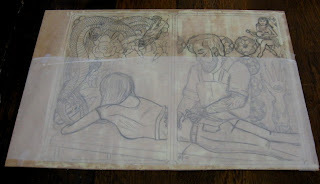 I continued the cutting of my tattoo block. Decided to go with the flowers next, rather than the dragon. They required a lot of detailed cutting, but not quite so detailed as the dragon, so I could get more done in an afternoon, and consequently I'll have more done by the next crit group meeting, about a week away. I cut the 3 large flowers near the top. I'll cut the 4th next time. I was able to get into the Studio for a few hours in the afternoon. I printed a late arriving student woodblock, then settled into my own work. Got out the tattoo block and my tools. 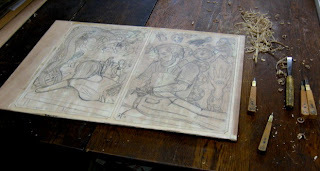 I cut out the outer border of the whole thing, including the space between the panels of the diptych. Then I turned my attention to the left side panel. 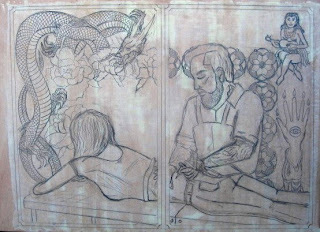 I cut out the negative space around the dragon and connected pieces (such as bubbles, flowers, etc) to the left and top. Unlike the previous print, this one will include some true negative space, not uncommon in traditional Japanese prints. It's a good start. Next time I think I'll deal with the flowers, and put off all the detail cutting of the dragon itself for a little while. This weekend we're gearing up for the Belmar Arts Council's biggest annual event, the Annual Juried Art show. It was the 2nd Annual show that got me involved with the BAC, with the show being held in an empty store on Main Street. This time around it's the 5th Annual, and the third show to be held at the Boatworks. I dropped by on my way home from work last night, and in exchange for a slice of pizza I helped with intake of works for a couple of hours. I went back again this afternoon to drop off a few pieces of my own. Once again over 250 works were dropped off, but there's only room for 80 or 90, depending on the size of the selected works. Only one per artist maximum, so I go back during the week to pick up what the juror rejected. I just hope it's one rejected and not both. The first weekend of the NCAA basketball tournament is over, and 65 teams have been cut down to 16. My brackets going forward are largely intact (one of my elite 8 teams is gone, but everything else is still alive), but only 2 schools that have exhibited my art remain- Villanova and Syracuse. Both have played well, but both have some difficult opponents between them and the Final Four. 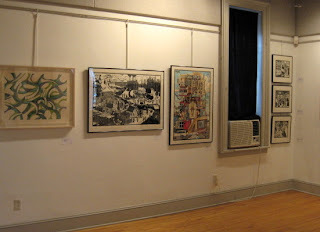 I spent the afternoon in Rahway at the Arts Guild of Rahway, at the opening reception for the relief print show currently on display. The top photo shows the nice building that is the Guild's home. I got there just as things were getting started. Crowds never got big today, perhaps because the weather was so nice. (warm spring days tend to inspire people to spend time outdoors) There was a constant flow of traffic, in addition to the presence of several of the exhibiting artists, so there were always a few people around to talk to. 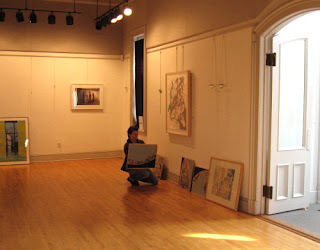 My pieces (those in the main room anyway) often had people around them, taking in all the details and trying to figure out what they were about. I spent a lot of time talking to people about A New Year for America and A History of Art in particular. The 2nd and 3rd photos show my work in the front and back rooms. The other photos show some of the other artwork. Passed out postcards and business cards to interested people. Molly never made it, but curator Stephen McKenzie was there, as were artists Susanna Bergtold, Michael Dal Cerro, Takuji Hamanaka, Idaherma Williams, and Tammy Wofsey. (if any of the others were there, I didn't meet them) Also saw some people I knew from other places- family, work, and NJ printmaking. The exhibition remains up through April 10th for all those who missed it today. Gallery hours and other information is available on the gallery website. Put in a few hours in the Studio today. I put another figure into the central area, a little more into the background than the standing couple in the tattoo shop. The wall of flash that the couple were looking at seemed too busy, so I erased it and replaced it with some simple marks that will stand for what's there without being as dense with images. I redrew two of the tattoo designs at the top of the right panel. A few more minor tweaks here and there, and I decided that I was pretty much done with the drawing. The final version is shown above- click to enlarge for the details. I didn't want to start the cutting today, but I did take care of the task of shapening some of my tools, which needed it after all the cutting of the last boardwalk block. In testing the tools I cut out part of the top border, but I'll begin the cutting for real next time I'm there. No art being made today, though some related tasks- grading student work, pulling slides, teaching a class. However, today's entry is in honor of St Joseph's Day, always celebrated at Studio Arrabbiata. 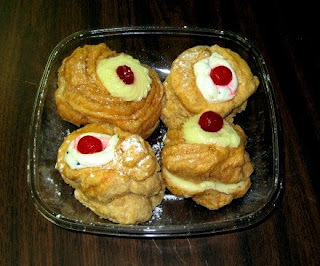 As is tradition, I went out to my favorite local Italian store and picked up a St Joseph zeppole, examples of which can be seen in the second photo. (I went with the white cannoli cream, not the yellow custard) But as long as I was there, I also bought a favorite sandwich, the Italian Combo. 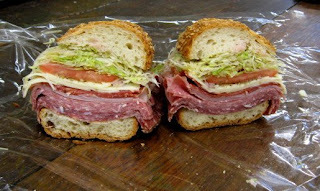 It's a variation on the classic Italian sub, but this one's made with salami, capicola, two kinds of soppressata, provolone, lettuce/tomato/onion, oil and vinegar, and seasonings, all on a sesame seeded roll with a nice crunchy crust. I ate the sandwich for lunch, but it was so filling, I never ate supper, just the zeppole for dessert. Enjoying my spring break this week. Part of that was being able to get into the Studio on a Tuesday for the first time in a while. A few minutes was devoted to printing a student block from last week, but mostly I was working on the current tattoo block. 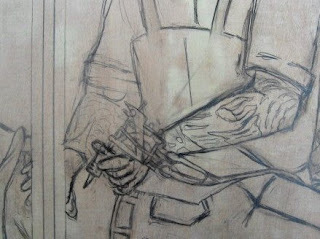 The first step was moving the artist's arm, the one not holding the needle, further up the customer's back and into next panel. For reference of the arm (complete with tattoos) I was able to use one of the photos I took of Rob at his shop, though it didn't include his hand, so I had to figure that out myself. 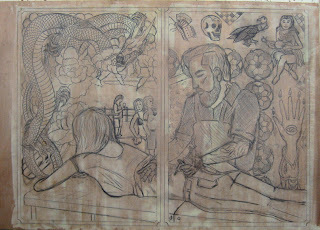 Into the part of her back vacated by the hand I was able to put in the butterfly tattoo that the actual customer was getting on the day I sketched the scene. Moving the arm cut down slightly the empty interior space. I decided to go with my plan from Sunday for this space, people in the shop. I put in the flash wall in the right panel, filling it with tiny versions of generic common tattoos- birds, tigers, skulls, flowers. On the other side I put in the couple, but larger than in the sketch I made Sunday. I left out the kid with the ice cream cone- not enough space. I also put in the basic boardwalk structure and indications for clouds, water and sand beyond the rail. I'll probably add a smaller figure or two on the boardwalk later. I also put in a few objects in the last remaining space, the top of the right panel. These are more items adapted from Rob's artwork. I'll check it out again in a few days, clean up some details, and if I like it, the cutting starts soon. I got back in time from the Studio visit and my weekly shopping to catch the annual NCAA Tournament Selection Sunday show. My Salukis are not in it this year, but with their losing record that was no surprise. As is my tradition, I noted which schools from the field of 65 are also schools where I have had my art exhibited. This year there are 6. In chronological order of exhibition they are Illinois (1994), Villanova (1997), Northern Iowa (2001), Texas (2001), Syracuse (2005), and LSU (2006). Chances of any of them reaching the Final Four are slim. Put in a little time in the Studio this afternoon. The reason was to work on the current tattoo block. I received some suggestions at the last crit group and have spent some time since thinking about which, if any, I'd want to apply to what I was doing. One that I considered exploring was changing the attire of the customer to something more typical of beach wear, such as a two piece bathing suit, or a bikini top and cut-offs. My first attempts at the top (on separate paper) got nowhere- just couldn't get it to look right. Put that aside for now. 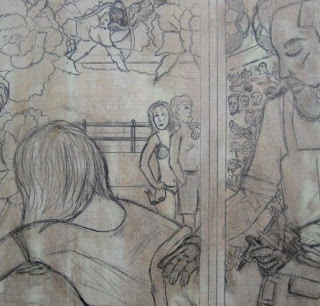 A few days ago I had traced the shape of the empty spaces in the center of the diptych. I reproduced that in a sketchbook and played around with it today. This was another suggestion, looking past the main figures to the interior of a shop and the light beyond it, with maybe some back-lit silhoutted figures in between. What I've got so far is something along those lines. In the narrow space between the artist and the border, a sliver of wall with tattoo flash (or at least what will represent that, since they'll be too small to make out.) In the main space, a couple (him looking up at the wall, her kind of hanging on him), both wearing bathing suits, and a third character, kind of standing around with an ice cream cone. They will be simplified, but not silhouettes. Beyond those figures, I have the boards and rails of a boardwalk, with empty sky beyond. Some small figures will be added there, and those will likely be silhouettes. Even if I can't resolve the bikini top, the interior section should be enough to give it the boardwalk link. Another change that needs to be made is to the artist's second hand (not holding the needle). Right now the scale seems off and what can be seen of the hand is split between panels, and we all agreed the other night that it doesn't work. My plan is to change the angle of the arm so that his second hand rests further up on her back. I'll deal with that in a few days. After that, maybe some of what I was exploring today. Today was a day spent travelling around the state on various art business. First up today was a trip to Rahway to deliver my part of the "Relief Printing: Contrasting Surfaces" show. Curator Steve McKenzie had asked me to contribute 9 pieces to the show, based on his visit to the Studio several months back. These were my 3 large pieces (all 24"x36") and 6 of my supermarket prints. Didn't have to do much to prepare- reframed 2 of the supermarket prints last night (would have been 4 if I had these prints that had been in Iowa were available when I needed work for PCNJ in January) and packed them all into one of my shipping boxes. Loaded all the stuff in my vehicle this morning, and after a couple of stops in town, took the long drive up the Parkway. 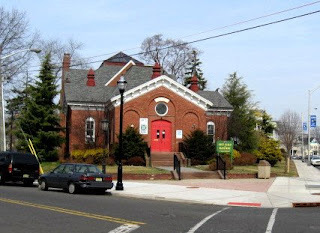 Arrived at the Arts Guild of Rahway exactly on time. I brought my pieces in and got them unwrapped. Molly turned up about 10 minutes later, having made a wrong turn at one point. Met the guys from the gallery, and a few of the other artists who were also dropping off work. A pleasant surprise was seeing Donna Gustafson there, picking up work from the previous show, which she had curated. 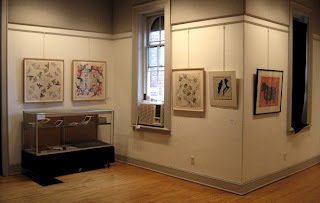 Donna was the director of exhibitions at the Hunterdon Museum several years back and a fan of my work, having given me a solo show there back in 2004. That one was also mostly supermarket prints. Today she had a chance to see a few new pieces of mine, still leaning against the wall. She also mentioned that she had considered inviting me to put a piece in the show that had just come down, one that it turns out will be in this one. When I took care of all my business there, I worked my way back to the Parkway, then down to 440/I-287. Stopped off for a snack, then back to the interstate, to route 22, and then arriving at the Printmaking Council around 12:30. They were open for business, preparing for the opening of a new show. I brought in all the stuff I had used to wrap/carry my prints to Rahway, now using them to wrap and pack the work I was picking up- 5 prints, 3 of which were copies of prints I had just dropped off. I ended up hanging around a while, helping put together some catalogs, discussing some upcoming shows (exhibition committee business), dropping off the entry form for the upcoming Humanity show, etc. From there, the long ride home, having covered about 140 miles when I was done. One week after the originally scheduled date, the March critique group met in the Studio tonight. As always, an interesting night. We had 7 artists this time around, all showing art in various stages of progress. 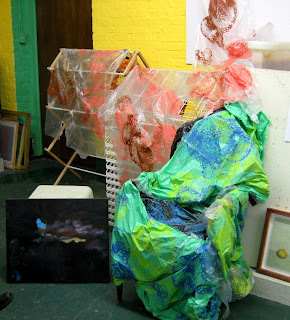 The top photo shows Jane's painting and some of Molly's printed pieces on plastic, part of a collaborative installation. 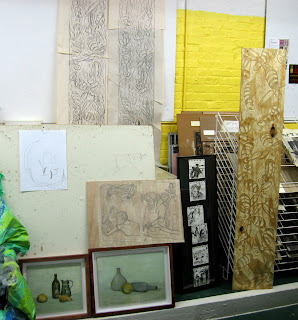 The second photo includes a doodle-inspired pencil sketch from Tim, two still life painting from Guido, Harriet's sketchbook pages from pubs in Ireland, Mary's large bee block and rubbings taken from it, and my current tattoo boardwalk block. My piece was the first one discussed tonight. I explained the idea, and sought suggestions as to how to show a boardwalk connection. My idea of showing a little bit of Asbury's boardwalk was debated- Jane pointed out that while they would make an attractive addition to the composition, those not familiar with the landmark buildings might not realize that they are part of a boardwalk, or at least this specific area. Some other suggestions included other boardwalk/coastal architecture (general scene, lighthouse), the interior of a tattoo shop (store sign, stuff on walls, figures silhouetted against the exterior light), or changing the attire on the woman to something more beach appropriate (bikini top, cut-offs, beach tag). Gives me some things to think about. Everyone else got some good feedback on their pieces, so it was a productive and fun session as usual. Hard to figure the weather sometimes. Five days ago we had over a foot of snow, followed by temperatures that neared single digits. Today it was sunny and around 70 degrees. I'm not one to complain about warm days in early March. I did go up to the Studio and got some work done on the latest block, but I spent more time outdoors than inside today. One thing that's bothered me for a while with this current block is that it has lots of good references to tattoos and their history, but not much to link all this to a boardwalk. Being part of the series will give it some of that context, but I'd like the image itself to carry some of that as well. 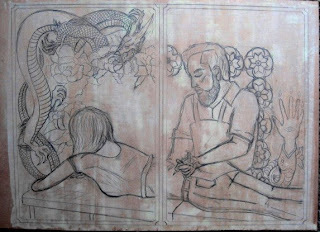 The parts of the block that are relatively empty right now are the top of the right side panel, and the space between the artist and his customer. Whatever I do to remedy this will be in one or both spaces. One obvious solution is to put in a view of a boardwalk. It could be the one in Ocean Grove (where I first met the artist- in my Studio), in Bradley Beach (where his shop is), or Asbury Park (where he lives and has exhibited his art). I took advantage of today's nice weather to walk to the Asbury boardwalk and take a bunch of photos of the former Casino and Carousel House. I shot it from the beach, the boardwalk, and the street. The top photo is one of many from today's walk. Tomorrow I'll make some sketches from the photos, and then see if anything comes from it. If I don't use any of the Asbury photos for the tattoo block, I'm sure I'll use them in another print in the series. After my walk I got back to work indoors. The other photos show some of today's work. 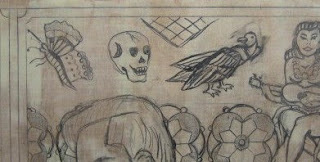 The second photo shows some small grid-like pieces added along the edge, something Ryan uses regularly in his painting. On the other side I started putting some stuff around the dragon, traditional design elements. The third photo shows a series of bars (often used to fill up the background in an area), while the last photo shows lots of little circle forms that are common in dragon images- bubbles (dragons are water creatures in Japanese tradition), or maybe even clouds. These may change before I'm done, but for now it gives me something to consider. 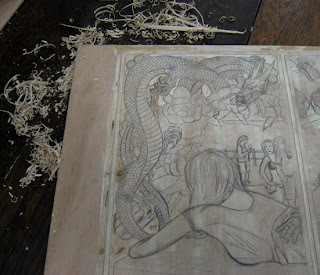 The block has remained in my house, and over the past couple of days I continued to work on the drawing at home. The top photo shows the current state of the whole block. 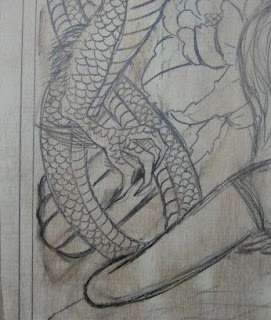 Other than filling in the rest of the scales on the dragon, the left side was left alone. The rest of the photos show the changes on the right. 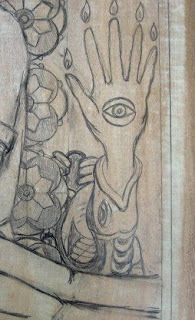 After redrawing all the mandala shapes (making them more regular and properly aligned), I put in a version of the hand emerging from the fish mouth (2nd photo). After considering this overnight, I decided that the curled body, with the tail squeezed in among the mandalas, left the corner too crowded and confusing. I changed it by making the fish a little larger (more accurate to the original) and straightening out the body. I like this better, so this stays. 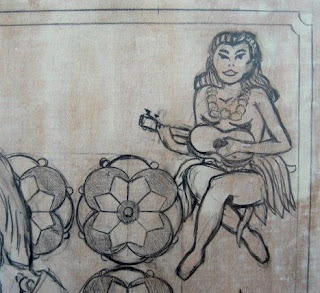 In the upper right corner I put in the figure of the island girl (Hawaiian I'll say) with the ukelele. This one is also based on one of Ryan's tattoos. I put it in because it's a traditional tattoo subject, it references the south seas history of tattoos, and my own long standing interest in things set in such locations (Gilligan's Island, Lost, Joe Versus the Volcano, etc). I also devoted some time to working on the tattoo artist, redrawing the electric needle and putting in indications of the tattoos on his arms. I think the two figures are now pretty much done. 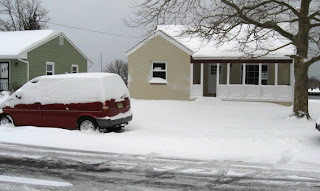 Molly tells me that the building where the Studio is has been plowed clear, so next time I work on this will be up there. Good thing I brought that block home from the Studio. Since that snowstorm has kept me indoors for the past couple of days, I've been able to advance the drawing a little further. More adjustments to the figures. They're almost done. On the left side I put in a dragon. 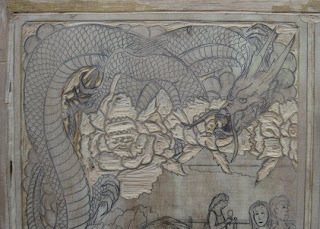 Dragon legends appear in the history of most corners of the world, but in no place are they more important than in China and Japan, and the dragon tattoo is a tradition going back to the time of the Floating World. 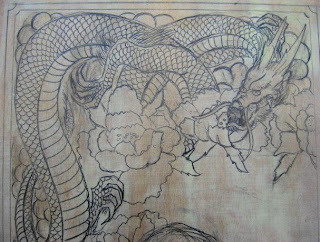 The dragon tattoos would be large, covering broad parts of the body, their twisting forms designed to flow over the wearer's body, moving with the muscles. I based mine on typical dragon tattoos I found in books (some supplied by my tattoo artist contact), contorting it to fit the space around and above the flowers. I didn't add all the scales yet, but there's enough there to get the idea. On the right side, I erased the chair, quickly sketched in a few more of the mandalas, and decided it was way better. I fixed them up a little for now, but they will need to be redone eventually. 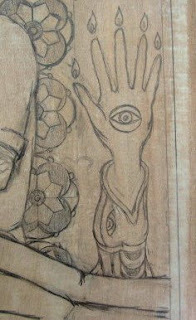 In the space next to them I roughed in a design based on one of Ryan's tattoos, one of his more mystical pieces. He didn't give me a specific meaning behind it, saying he just combines a lot of different traditions of mysticism, eastern and western. It will be modified considerably before I'm done, but I expect it will stay there. Turns out that the weather forecasters were correct about the snow. We had about an inch overnight on Saturday, but the big event arrived Sunday night and continued into this afternoon, dumping over a foot on everything. Under the circumstances, Molly and I decided to postpone the usual first Monday critique night until next week. So we will have our next meeting on Monday, March 9, from 7 to 9 pm. Next month things should revert back to the first Monday schedule.